CNBC’s resident “oracle” is at it again. Jim Cramer, the overexcited host of the cable channel’s “Mad Money” show, has once again shown off his unique skills at forecasting the future… and destroying the portfolio of anyone who follows his advice. 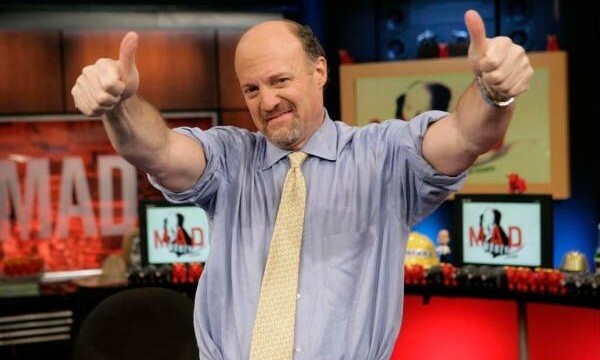 Cramer is the infamous investing “expert” who clownishly prances about his TV studio while shouting out “buys” and “sells” and yelling “Booyah!” every few minutes. But the harsh truth is that his advice can be poison to your portfolio. In fact, in the past year, he’s made one of his most ridiculous and irresponsible calls yet. I just hope you didn’t listen to him. Sun’s shares nosedived after that call by 98% before the company was eventually acquired by Oracle in 2009. Tesla shares skyrocketed nearly 500% after that call. Just days later, Bear Stearns went bankrupt, launching a broader stock market collapse. In April 2015, Cramer recommended renewable energy company SunEdison Inc. when shares were trading around $25. After the stock dropped 60%, he went on live TV to apologize for his terrible mistake. Are you kidding me? Averaging a loser on the way down? SunEdison shares were hovering just under $10 at the time. Seems like a great bargain, right? Cramer’s website thought so. Shares had already dropped from $25 to $10. How much worse could it get? SunEdison shares now trade at 49 cents as I write this. And the company is on the brink of bankruptcy. 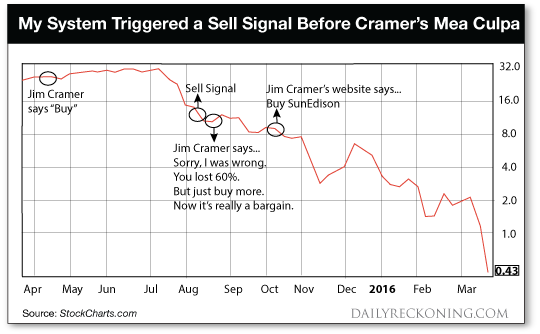 There are many more examples like this from Cramer. But I don’t have the patience to go through them all. A Google search will help you if you want more. 2) Never try to predict the future. 3) You should never buy on market weakness (don’t average losers). The first point above is self-evident. If you don’t agree, enter “Booyah!” and “Jim Cramer” into a YouTube search. The prosecution rests, Your Honor. Second, the biggest market myth is that big profits come from predicting future prices. But that’s pure fantasy. You don’t make money in the markets by guessing what will happen… as Cramer has proven over and over and over again. Will he get some right? Sure… just as a blind squirrel will find a nut now and again. But this is investing, not Vegas. No one can predict the future. If someone tells you they can, clutch your wallet and start running in the opposite direction. Third, you should never buy on weakness. Buying on weakness means you’re betting against the trend. Those three words, “buy on weakness,” will send you to the poorhouse. History is not kind to investors who invest against the trend. When prices trend lower, they often continue to head south… sometimes all the way to bankruptcy (where SunEdison appears to be headed). You don’t want to ride with them. Let me be blunt: The world’s wealthiest traders don’t listen to hyperventilating teleprompter readers on CNBC… they never try to predict the future… and they counterintuitively sell weakness and buy strength. They have a trend following system, similar to the one we use in Trend Following with Michael Covel. My system triggered a sell signal in August when the stock was trading at $10.30. A sell signal means get the hell out… or short the stock. Excited about other solar stocks?​ Don’t go there. The entire sector is in “sell” mode. The main thing is if you are in this just to be entertained by guys like Cramer, just be sure to ignore their advice… or you might end up like SunEdison’s shareholders. Please send me your comments to coveluncensored@agorafinancial.com. I want to know what you think of my perspectives – the good, the bad and the ugly.